At 215 feet, Hartman Tunnel is the shortest along the OML. Like most of the route's other tunnels, it was built around 1902 to straighten what had been an excessive curve around a hill. 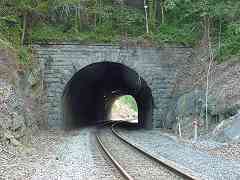 The 6 degree curve that remains is exceeded only by the 7 degree curve of the Union Dam Tunnel. 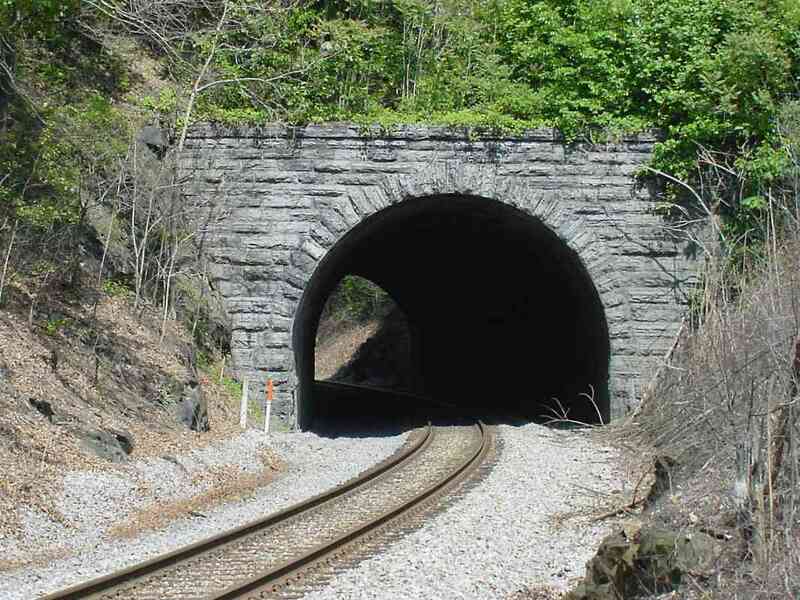 The limestone of Hartman Tunnel's west portal shines brightly in the May sun. The origin of the name Hartman appears to be with a landowner in the vicinity. The only Hartman mentioned on the Frederick County ADC maps is located east of I-70 exit 59. 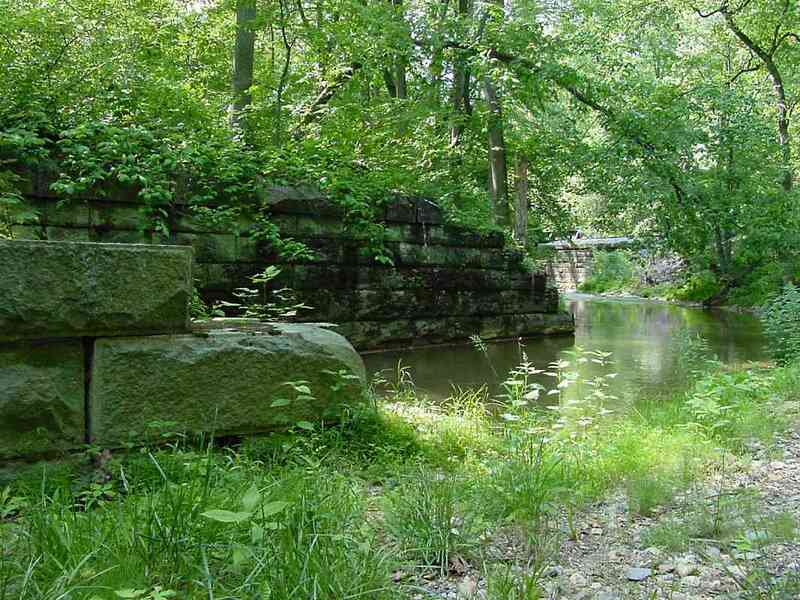 Hiding in the woods on the south side of the current ROW are stone piers from the Bush Creek bridge abandoned when Hartman Tunnel forged the new route. Note the lack of mortar, indication of original circa 1830 construction. Part of the current bridge (33C) can be glimpsed in the distance downstream at center right. At bridge 33C, CSX 712 leads an eastbound coal drag uphill to surmount Parrs Ridge at Mt. Airy. 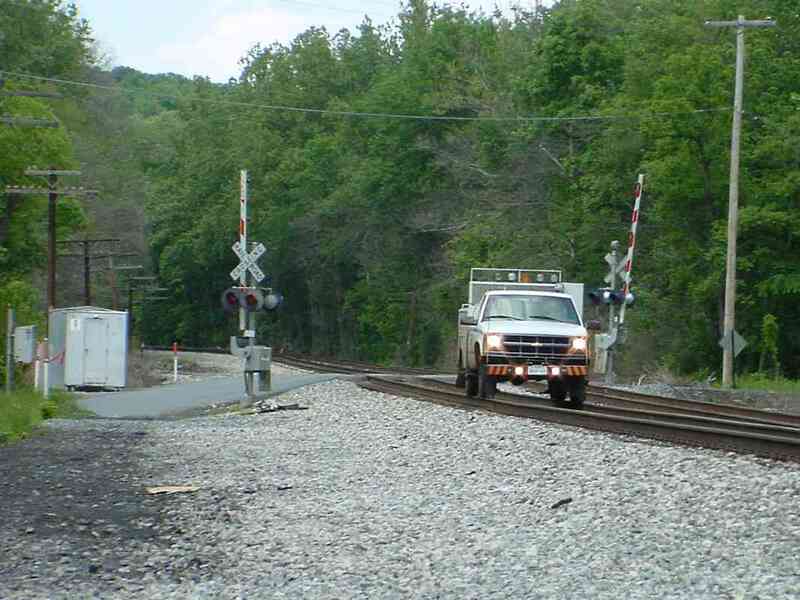 In the distance, communications engineers check the status of the new signals at East Reel, one endpoint of a roughly 12,000 foot siding, the OML's longest. Because the dish (left of tracks) is oriented SW, I'm guessing it is pointing to a geostationary satellite. Anyone know for sure? In the foreground is bridge 34 with a plaque that reads "American Bridge Company. U.S.A. 1927". Within a mile long stretch in this area, the OML spans Bush Creek a total of 4 times. 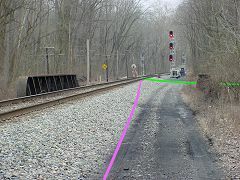 In the 1800s the tracks followed a very different alignment (green line) that can also be toured. Some days on the OML it's more likely you'll see inspection and maintenance vehicles than trains. This one has just passed the Reels Mill Road grade crossing. 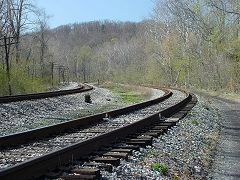 At this spot eastbound trains begin their ascent over Parrs Ridge at Mt. Airy. 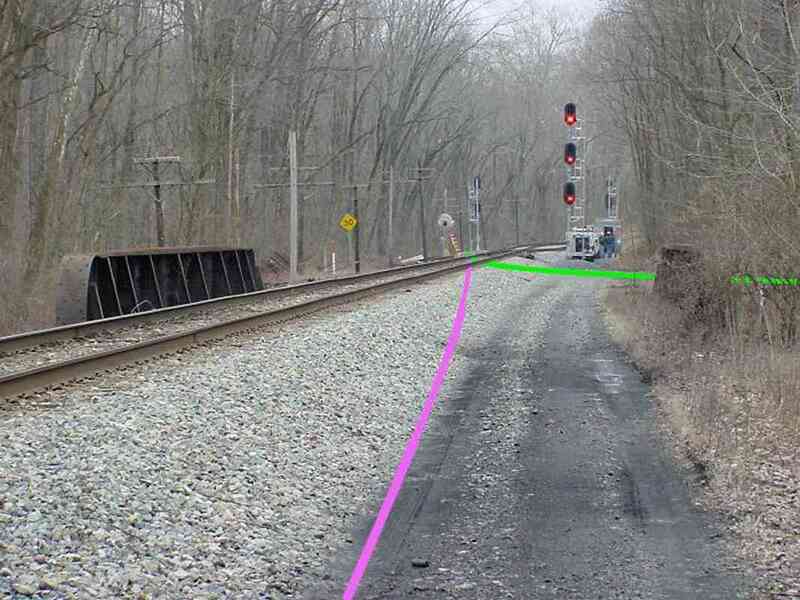 The increase in spacing between the OML and its siding marks the location of Reels Mill Yard. 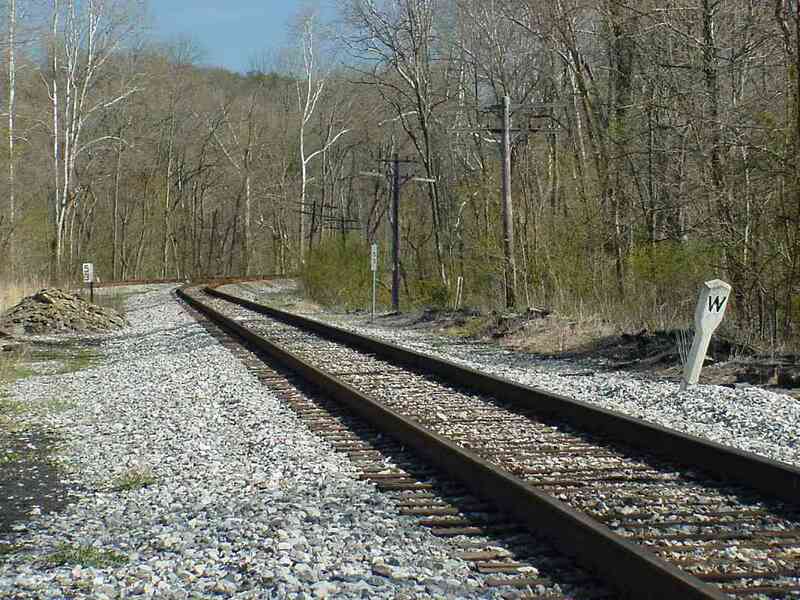 Around 1903 the B&O constructed a helper station here, with coaling trestle, interlocking tower and water tank. But, the helper engines were actually based at Brunswick, some distance west, and there were no turning capabilities at Reels Mill. 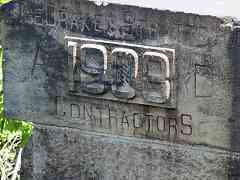 The incompleteness of the facilities led to their closure in 1925. Before Tesla covered the song, the Five Man Electrical Band sang those lyrics. 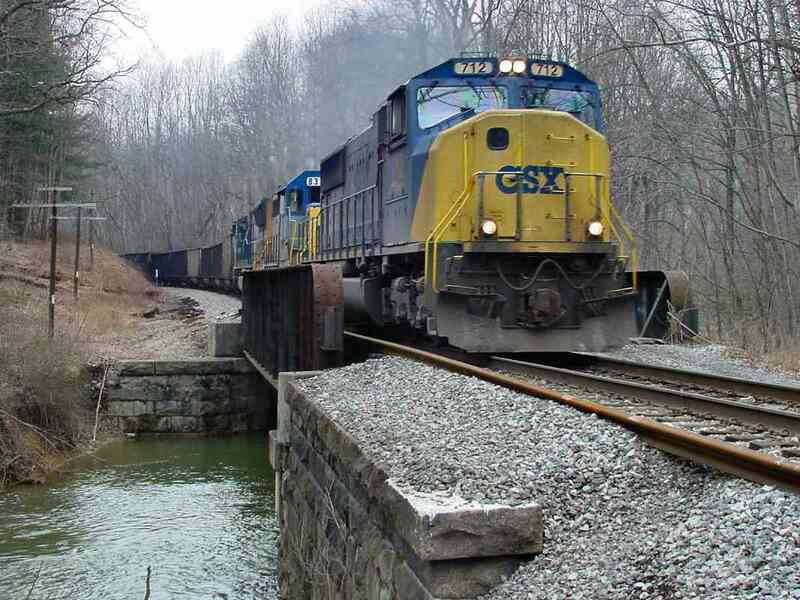 Before electricity powered locomotives, coal did. The soil at the bottom left is black with detritus from the coal tower that once stood at this location. 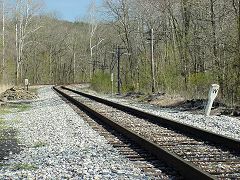 In addition to the W whistle post for the grade crossing ahead, three generations of mile 53 sign posts are blockin' out the scenery. Between the tallest and newest 53 and the utlity pole, note the milepost on a rail, the oldest marker of the bunch. If the tracks appears to be descending as they leave Reels Mill Yard, it's because they are, slightly, down to the Monocacy River, which is the next stop on the photo tour. 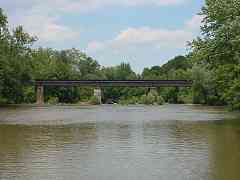 The Monocacy River might be the OML's most substantial water crossing. 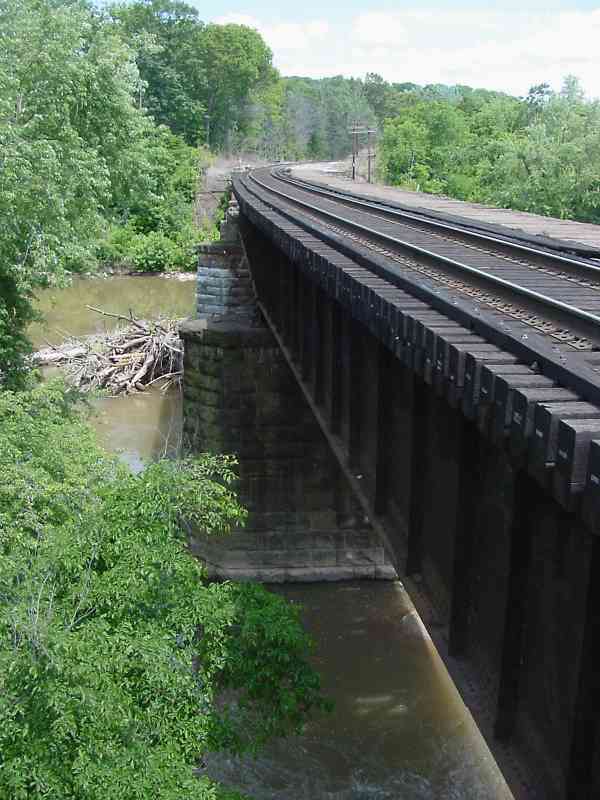 This bridge was a favorite target during the Civil War, and the B&O had to rebuild it many times. 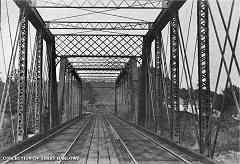 The original bridge was a covered wood variety, but wooden bridges were easily set afire, so the B&O tried iron Bollman bridges, but even they were not permanent. September 8, 1862: The splendid iron suspension bridge at Monocacy blown up by the enemy. The water station at Monocacy, including pump house and engine, also burned. September 15, 1862: Commenced removing debris of Monocacy bridge. This vicinity was the camping ground of the Confederate army, and before operations could be commenced at the bridge, dead men, horses and cattle had to be buried. 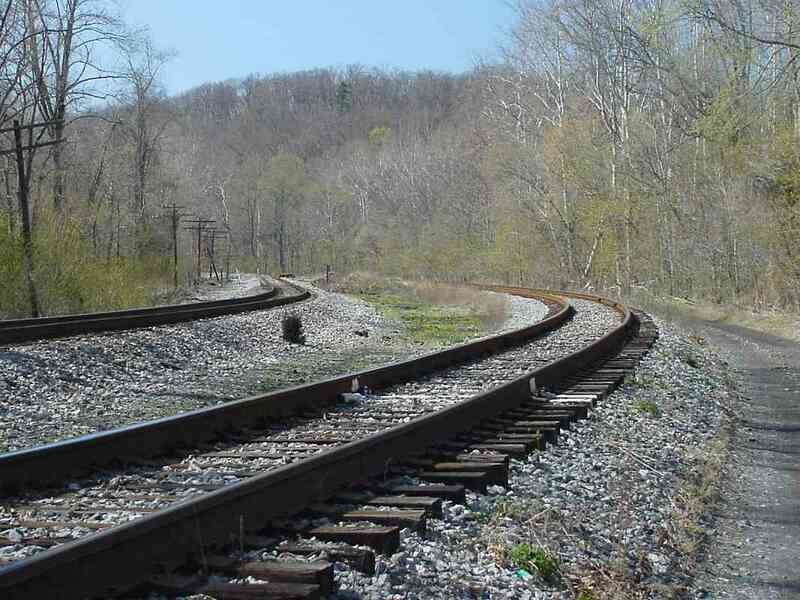 September 17, 1862: Monocacy trestling commenced; crossed trains over at 11 AM September 21. September 25, 1862: The water station at Monocacy was rebuilt during the month. April 24, 1863: Monocacy River higher than for many years. 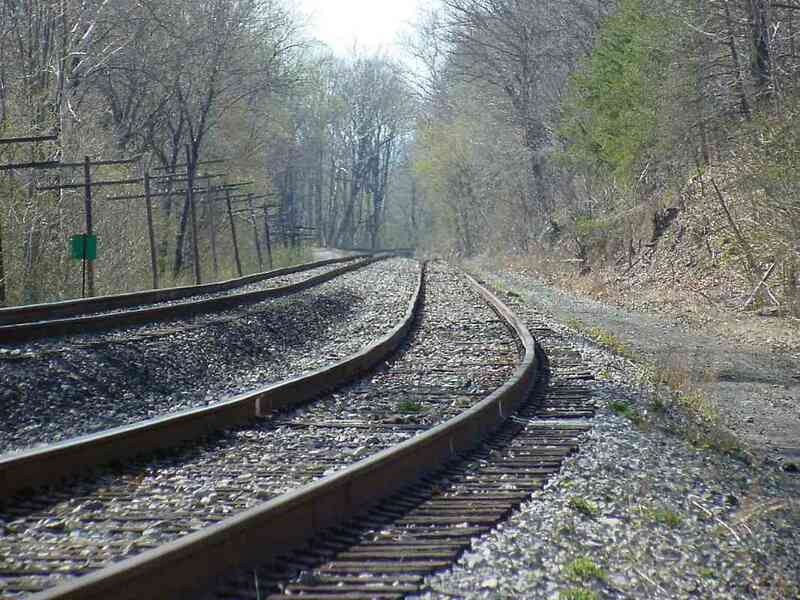 June 3, 1863: Rumors of an advance of the enemy; no freight trains ran west of Monocacy until night. June 18, 1863: All the engines and cars sent from Frederick to Baltimore. Frederick train went into Frederick and returned to Plane No. 1 for safety, and went again to Frederick on morning of the 19th for passengers. June 20, 1863: Frederick train went only to Mt. Airy; the enemy in Frederick. June 21, 1863: The enemy at Mt. Airy. Track torn up at Mt. Airy and telegraph wires cut at midnight and repaired next morning. 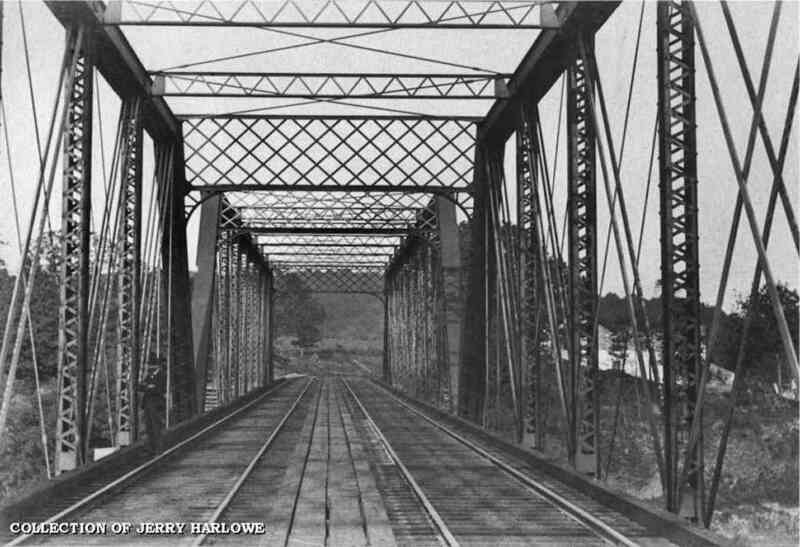 January 21, 1864: Commenced the erection of the east span of the Monocacy iron bridge and completed it on the 25th. 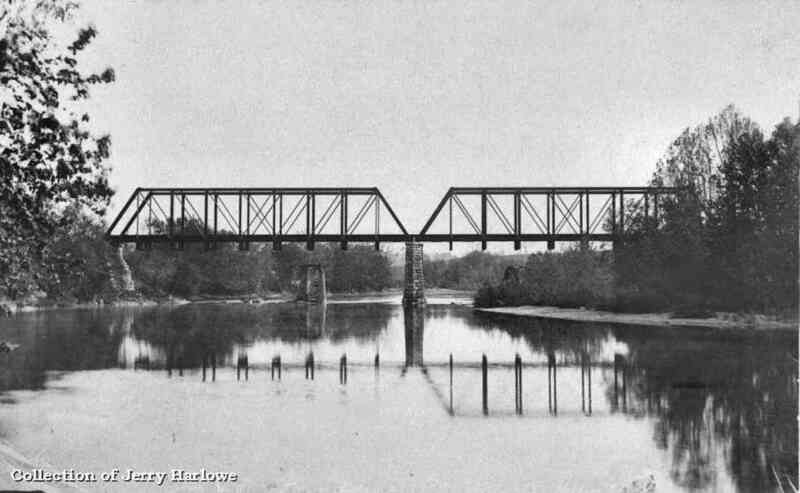 Civil War book author Jerry Harlowe kindly submitted this photo of a heretofore unknown bridge design which spanned the Monocacy River. This view upstream is very similar to that of the prior photo. 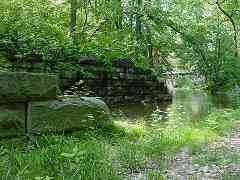 Note the disused shorter stone bridge supports; those had been used by standard Bollman-style bridges. Until discovery of this photo in 2003, it had been thought the Bollman bridge had survived until replaced (around 1920?) by the bridge which still graces this location today. Instead, the bridge seen here chronologically follows the Bollman design and precedes the current. If you compare this photo with the modern one, you'll note the modern one shows more stone supports have been added, ostensibly to support heavier loads. Jerry reports finding the old bridge photos in an antique store in Frederick. Here's a view from trackside of the 350-foot long deck girder bridge. Like most (all?) 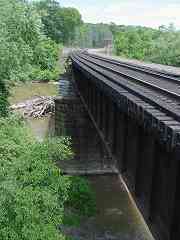 OML bridges, the Monocacy Bridge had been double tracked through the 1950s. This photo, another Jerry Harlowe discovery, roughly duplicates the view of the modern photo above. Note the person standing on the left, as well as the light weight of the rails and bridge structure. The crossbars on the sides of this bridge are reminiscent of those used in greater quantity on standard Bollman-style bridges. I wonder if this bridge might also be of Bollman-company origin, simply a later version of the original design. Thanks for the contributions, Jerry! 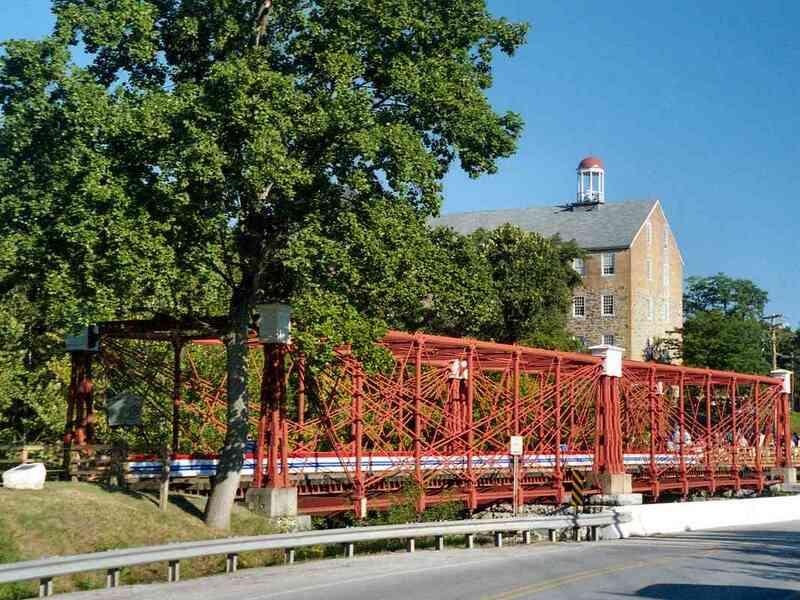 The Monocacy River bridge has been rebuilt and updated more times than any other OML bridge. One update was performed less than 50 years after the Civil War, as evidenced by this date stone. 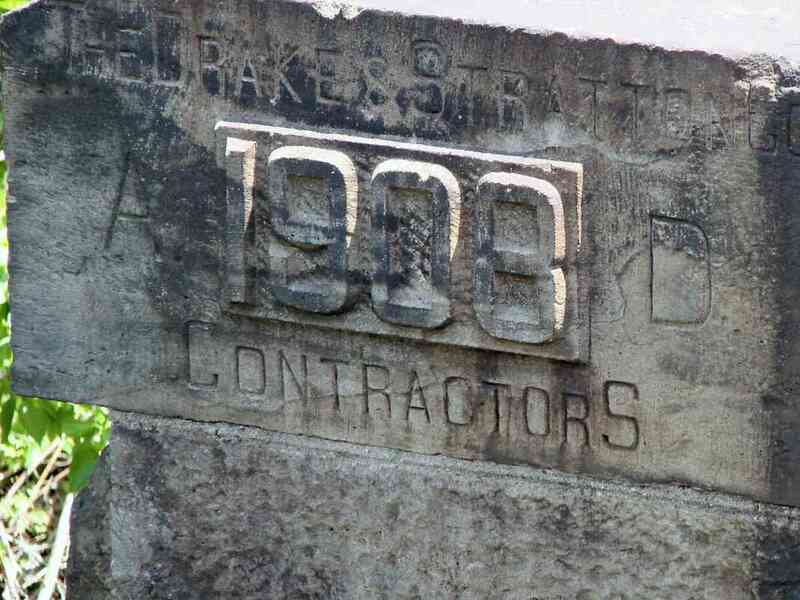 It reads The Drake and Stratton Co. 1908 AD Contractors. Drake and Stratton was an engineering company with offices in New York and Philadelphia that assisted many Northeast and Midwest railroads with bridge building tasks. Time has erased much of what was Frederick Junction where the OML meets the 3.5-mile branch that leads into Frederick. This photo looks across the Y made between the OML and spur. 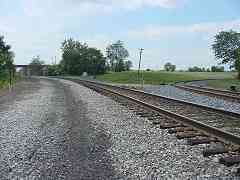 The Frederick Junction Station sat within the Y near the lonely utility pole at photo center.